On Friday night the undefeated Buffs are set to take on the UCLA Bruins at 7pm. But before another exciting home game at Folsom Field you don’t want to miss out on the Stampede happening on Thursday night! The Pearl Street Stampede is the perfect way to show your support for the Buffs and get excited for upcoming games! Pearl Street Stampedes have become THE kickoff celebration for CU home games. The night before each home game hundreds of excited Buff fans line the mall as members of the Golden Buffalo Marching band play and members of the CU Boulder football team are greeted with cheers and shouts of encouragement from the crowd. Don’t miss seeing the lively CU mascot Chip either as well as the very talented Spirit Squad! The Stampede kicks off at 7pm on the 1300 block of Pearl Street in front of the Boulder County Courthouse. The marching band will begin performing and then the Stampede—led by Stephen Tebo’s vintage 1948 fire truck—moves west on the mall stopping on each block to perform. This great tradition is free and fun for the whole family to enjoy! Be sure to make some time for dinner or shopping while you are on the mall. I recommend Pasta Jay’s, a hearty old style Italian restaurant located on the West End of the mall. Pasta Jay’s is the perfect place to sit down either before or after the Stampede festivities! Owner Jay Elowsky is a huge Buffs fan and proud founder of the Pearl Street Stampede. 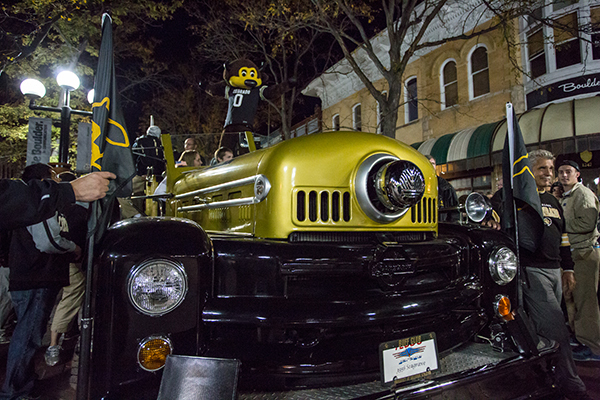 To find out exactly how Jay likes to spend gameday in Boulder check out his My Boulder Itinerary! To find all your CU apparel needs stop in and shop at Where the Buffalo Roam so you can head to the game all decked out in Buff colors!